2017 marked a milestone in the three year process of fixing South Carolina's crumbling roads and bridges with the passage of a much needed dedicated funding stream. While most of the public debate, and rightfully so, centered on the funding commitment, the three years of work leading up to it was spent reforming the agency to ensure the most efficient use of funds and accountability within the department. With that in mind, I have provided several tools designed to improve transparency and allow you to track progress. 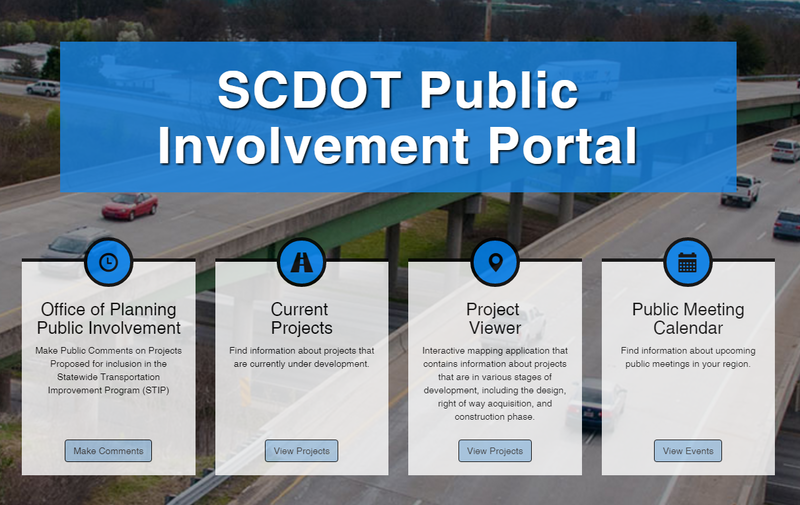 For those looking for specific details on current road projects, I would encourage you to look at the Project Viewer. This interactive map highlights all current projects administered by the department. Here you can find project type, location, timeline, points of contact, download project sheets, and more. In addition to the data provided in the Public Involvement Portal, you may also find detailed finance and organizational data. In accordance with Act 40, the South Carolina Department of Transportation makes available materials in advance of Commission meetings. You may find these materials as well as meeting announcements here.